Both the actors met on the sets of Alone in 2015, and they are dating each other since then. The couple looks very cute and adorable in the 25-seconds long video filled with the warmth of love. Bipasha has adorned white bridal gown while Karan is seen in a black tuxedo. They appear to be monkeying around with each other.
? My favourite couple are getting married! @iamksgofficial & @bipashabasu????? I’m So So Sooo happy!? ???? 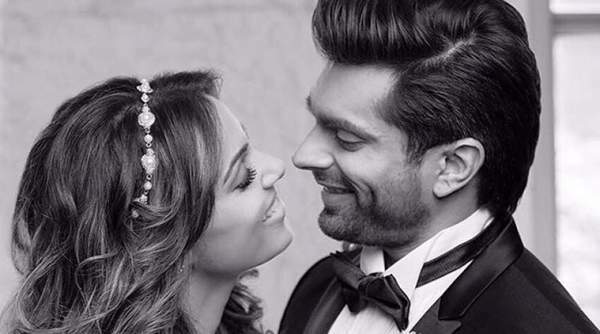 #karan#karansgrover#karansinghgrover#ksg#iamksgofficial#iamksg#actor#bipasha#bipashabasu#kasha#karanandbipasha#bollywoodactor#bollywood#wedding#April30#bipashakaranwedding#marriage#?#? Bipasha has flaunted her engagement ring in the video. However, she has already been seen wearing it at many events in the past. But, it is only now known that it’s her engagement ring. Dressed up for Delhi Afternoon!!!! After doing film Alone in 2015, they have continuously spotted together. Both of them went on holidays, seen together at several events, and they were present at a launch function and promotion of a fashion line launched by a close friend of Bipasha and designer Rocky S in collaboration. As per the early reports, it is strongly suggested that the wedding will take in Bengali style at Bipasha’s residence / home in Mumbai. A grand reception party at night will follow the wedding. All the Bollywood is expected to grace the event. It would be the third wedding for Karan while the first one for Bipasha. The actress was earlier hitched to John Abraham, Harman Baweja, and Dino Morea. Karan first and the second marriage took place with Shraddha Nigam and Jennifer Winget respectively. His married life with Nigam ended in just ten months and got separated from Jennifer in 2014. Stay tuned to The Reporter Times for latest Bollywood news and celebs updates acorss the globe. Don’t forget to share it on social media with your friends. Share your views and thoughts regarding their wedding.